If you've eaten pineapple and experienced burning in your mouth or chest, it may make you think that pineapple isn't the right fruit for you. Although it's a good source of essential nutrients, pineapple is also an acidic fruit that contains an enzyme commonly used as a meat tenderizer. As such, it can cause the uncomfortable side effects. Knowing how to minimize the burning when you eat pineapple may help you enjoy it. The burning you feel in your mouth after eating too much pineapple is due to bromelain, an enzyme that digests protein. Pineapple is the only natural source of the enzyme, according to The University of Melbourne. 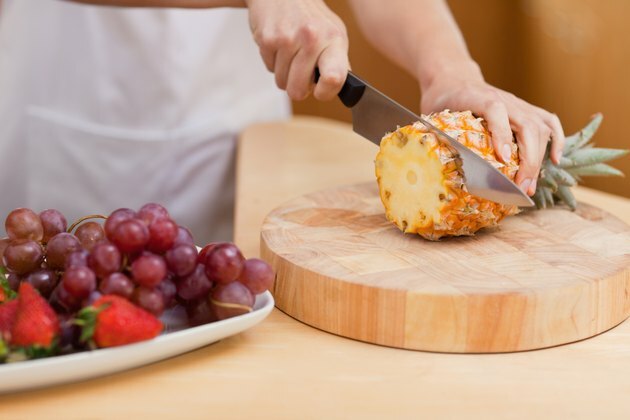 Most of the enzyme is located in the stem of the fruit, and you may be able to minimize the effects of the enzyme in your mouth by cutting out the core of the pineapple before you eat it, suggests the website Popsugar. If you have gastroesophageal reflux disease, or GERD, you may have a difficult time tolerating pineapple. Pineapple increases the acidity of your stomach, which may make the pain you feel in your esophagus from the reflux more intense. Pineapple tolerance for people with GERD is individual, and your doctor may be able to help you determine the amount you can eat without pain. In some cases of GERD, avoiding the food that causes the most irritation may be the only solution, according to the McKinley Health Center. Your Hawaiian neighbor may suggest you add salt to your pineapple to lessen its acidity. Sprinkling salt on your pineapple enhances the sweetness of the fruit, which alters its acidic taste, but may not have much of an effect on the actual acidity of the fruit. Americans already get too much salt in their diet, according to the 2010 Dietary Guidelines for Americans. High intakes of salt increase the risk of developing high blood pressure. Adding salt to a healthy food like pineapple may negate some of its health-promoting attributes. Like most fresh fruit, pineapple is low in calories and rich in a number of nutrients that promote good health. A 1-cup serving of fresh pineapple chunks contains 82 calories, 21 milligrams of calcium, 180 milligrams of potassium and 78 milligrams of vitamin C. Calcium promotes bone health, increasing your intake of potassium may help improve blood pressure and vitamin C is an important antioxidant that protects your cells from damage by free radicals. Additionally, the bromelain in the pineapple may act as an anti-inflammatory in the body, according to the Memorial Sloan Kettering Cancer Center. University of Melbourne: Scientific Scribbles: The Flesh-Eating Pineapple It’s Historical Popularity… and the Next Cancer Treatment? Popsugar: Burning Question: Why Does Pineapple Irritate Your Mouth? Columbia Health: Go Ask Alice! : Which Foods Are Acidic?